Imbuko Releaf: Cabernet, Merlot & Shiraz, Imbuko, South Africa. Imbuko Releaf is an elegant wine offering intense blackberry & cassis flavours leading to a finish with enchanting vanilla spices. It is a big, rich powerful spiced number. There are drying fruits, blackcurrant, plums and a Cabernet presence, tannins coming in at the end. 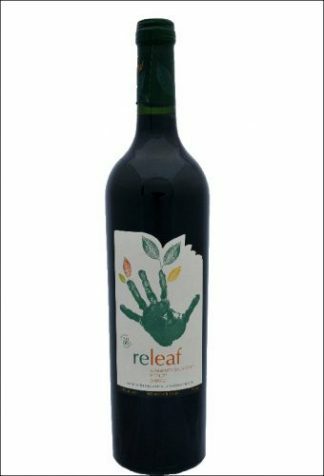 The Releaf wines are made from 100% hand harvested organically grown grapes. Only sustainable farming practices are used in the vineyards. The 2010 vintage was made from 44% Cabernet Sauvignon; 29% Merlot and 27% Shiraz. The Imbuko winery is situated on the Uitkyk farm, near Wellington in the heart of the Boland Winelands, South Africa. Part of the proceeds of the Imbuko Releaf wine goes to the Imbuko Schools Support Project. The school’s motto is: ‘dare to make a difference’. Read more on the Imbuko social responsibility programme. Releaf wines care for the environment and wines are bottled in using partially recycled bottles. The labels are printed on recycled paper with sustainable inks. Releaf Cabernet, Merlot & Shiraz, Imbuko, South Africa.